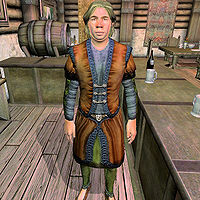 Hafid Hollowleg is a Nord publican and the innkeeper at the Jerall View Inn in Bruma. Hafid serves his tavern most of the time, only stopping to eat at 8pm for two hours. Hafid also cheers on Martin when he marches off to the Battle for Bruma. He rents beds out and buys potions and ingredients, but only sells food. He will rent a bed out at anytime, but will not barter with you when he stops to eat. He wears a russet felt outfit with a pair of russet felt shoes. He also carries a modest sum of gold. Speaking to Hafid Hollowlef for the first time, or occasionally afterward, while in the Jerall View Inn will have him greet you by saying: "Welcome to Bruma, stranger. Hafid Hollowleg. I'm your host at Jerall View. Bed, food, whatever you need." Asking Hafid about Bruma will have him say: "Lyra Rosentia [sic] collects Akaviri artifacts. She might have a project in mind. Her house is west of the chapel." Asking Hafid Hollowleg about renting a room will have offer you a bed for the night: "There's a most comfortable bed just downstairs. A wonderful room, and nicely priced at 25 gold a night, if you're interested." Telling him that you aren't interested in rented his available bed will have him respect your choice, occasionally reminding you to visit him again if you change your mind. Claiming that you wish to rent the room without the appropriate funds will have him turn you down in disgust: "Well, I must say. You have some nerve, attempting to swindle me out of a night's stay. If you've no gold, I suggest you find alternate lodging." Asking him for the room with enough gold to rent it will have him accept your payment and point you in it's direction: "Excellent. It's just down the stairs there. The door is impossible to miss. I'm sure you'll sleep very well." Asking him about the room again after renting it will have rhetorically ask you if you enjoy your lodgings: "The bed is quite luxurious, is it not?" If asked about 'Bruma', Hafid may reply that "Lyra Rosentia collects Akaviri artifacts. She might have a project in mind. Her house is west of the chapel." Despite this, there is no quest connected to Lyra Rosentia. It is possible that she was originally intended to be the quest giver for the quest Lifting the Vale. Esta página foi modificada pela última vez à(s) 19h33min de 14 de maio de 2013.